Megan Sukys is not only one of the best storytellers I know; she’s also one of the best story coaches I know. As writers and storytellers, we’ve talked about these questions a lot: What’s going to bring an audience in? How does the power of story work? What’s going to build suspense? How do we identify with the stakes and tellers of stories? Why are stories important for everybody? Megan can tell you, and she coached me through telling my own story for the first episode of her storytelling show, Drunken Telegraph. She co-produces this show with Tad Monroe, a writer and pastor, here in Tacoma. 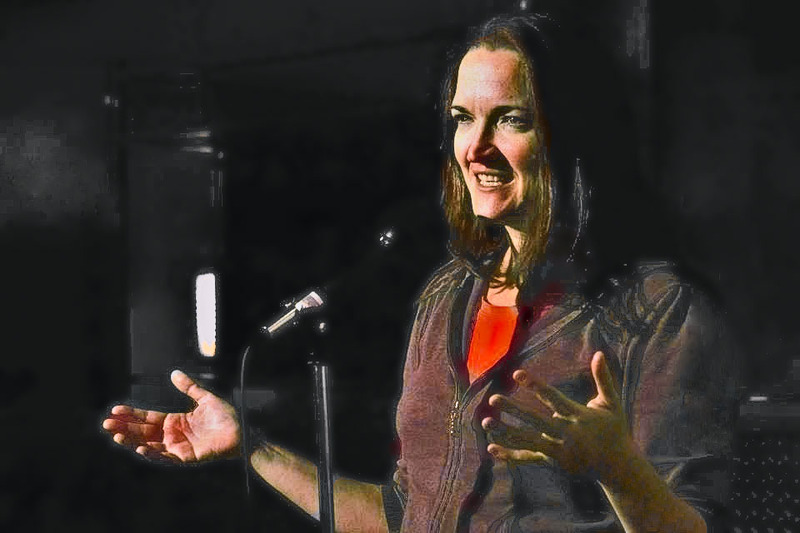 Storytellers in the show range from novice to expert; the first half of the show is curated and coached by Megan and Tad, while the second half of the show is an impromptu “story slam” where audience members are invited to participate. The show’s moved from Tacoma cafes to pizzerias to restaurants and bars, and now back to Megan’s theater roots, the Broadway Center. People don’t often know what to expect from the show, but newcomers often come away with new stories to tell, others’ stories to retell, and even new ways of shaping their own stories. The first long conversation Megan and I had was over a pot of chicken adobo, at my house. She was interviewing me for a story on public radio. After many long conversations and walks around Wright Park, I asked if I could turn the microphone around (so to speak) and interview her for the Star. We talked about her storytelling roots in the South, about the power and magic of story, and about Drunken Telegraph and asked how we could think about storytelling as a form of community-building? Here’s a lightly edited version of our online conversation. Tamiko Nimura (TN): First of all, thanks for taking the time to talk to me. You know that I am pretty new at interviewing people, whereas you’re a pro, so I appreciate your patience with my green-ness. Megan Sukys (MS): I’m pretty green at being interviewed, so we’re even. TN: Ha! Perfect. I want to start with some of your background in storytelling–the art of verbal storytelling, that is. Where are your roots here? MS: My storytelling roots are in North Carolina and my family. As a kid I rarely got a straight answer to any question. Instead, I got a story about something that someone did at some time and what happened to her because of it… and I was supposed to glean the answer myself. I finally asked my mother why no one was straight with me. TN: Sort of like legends and myths — origin stories, no? MS: But, I often found the stories had a hidden meaning, “AND SO IT SHALL EVER BE”. TN: Right, the South and Tradition with a capital T.
MS: Yes, the story is bigger than any one person. TN: Do you miss that answer-through-story here in the somewhat reticent Pacific Northwest? MS: When I moved out here, I felt lost with no one to explain why everyone acted the way they did. TN: No stories! Or, hidden stories. MS: At the same time, I felt free to tell my own story in my own way, without having to justify it in the context of the larger Southern family narrative. For me it felt like ‘no chance to tell stories’. TN: Ah! And thus, in part, the birth of Drunken Telegraph. MS: I got the sense that the Northwest (and the West coast in general) was a place where people came to rewrite their stories, make the story they wanted to live. Without a way to share those stories we all worked so hard to get the chance to live, we lose a sense of what it’s worth to strike out in a new way. Now, there are places where people do tell stories: college dorms late at night, first dates, chat rooms. AA meetings, church, therapy, timeshare sales pitches. TN: Not to mention social media, Facebook, Instagram…. TN: Not very often, it’s true. MS: And without the chance to look at my life for that and develop a story about it, I may let the wisdom of my experiences lay fallow in my past. But then, telling a story that someone wants to listen to isn’t so simple. There’s a reason we don’t go asking everyone, “What wisdom do you have?” So, with Drunken Telegraph I tried to think of an event that could offer people stories worth listening to and a chance to learn how to tell stories people enjoy hearing. I’m not the first person to do this, of course. MS: I started telling stories on-stage with Seattle’s “A Guide to Visitors”. MS: Jeannie Yandel was one of the founders and she and Dave Snyder, the other founder, were inspired by the earliest days of “The Moth” – before it was on radio. I learned a lot from the way they built in story workshops to their performances. They worked with storytellers before the show to help them identify the best elements of their stories and shape the narrative so it would hold the audience’s attention. When we tell stories, if we tell them well, our audience can’t help but imagine themselves in our shoes. That’s what story does, it creates a shared experience. And so, while I may not agree with your politics or religion or any number of other issues, when I listen to your story I create my own memory based on your life. We now share something. And when we share experiences, we’re more likely to share other things, like compassion and understanding. TN: Ah! Is this the community-building part of storytelling, then? The ability to build or develop empathy? MS: And understanding. When we tell our stories, like those old fables, we bring other people into our personal mythology. “This is why I am the way I am.” Without that, I can assume you don’t agree with my beliefs because you’re just an idiot. Story breaks down that sense of “THE OTHER”. It breaks it down because when I listen to your story, I’m imagining myself as you. And doing that is coded deeply into our brains, it’s how we understand our world as humans. TN: But transformation, I’ve heard you say, is essential, so this is how it’s different than the storytelling that only explains why we are who we are. MS: We become who we are through transformation. TN: So because transformation’s involved, a good Drunken Telegraph story in this case doesn’t serve to codify tradition, as it might have in the Southern context you were talking about. MS: With DT we’re looking for personal stories, the stories that make you you. You tell a story about you. That is different than stories that tell the tale of a group. MS: Not all story shows are centered around community. Some are focused primarily on entertainment, especially national shows. They have to be. That’s why I wanted to build something rooted in the community. I spent more than a decade working on telling really good stories, trying to figure out why some captured listeners and others didn’t. It’s fantastic fun to hear a master storyteller, but it can also intimidate us from trying to tell our own. TN: And now you can pass that on to those of us who can feel intimidated. MS: Yes. I could see what a difference it made in people’s lives to be able to take a mess of intense moments and weave it into a story with meaning. I could see what a difference it made for people to hear stories like that. But, those techniques are often industry secrets. TN: And this is how storytelling and Drunken Telegraph are antidotes to the social media of our lives. However, in most circumstances, the attention and space limits of social media force us to reduce our experiences to the briefest of observations or statements, with no room for the transformation. TN: Yes! That’s the missing piece! TN: And blogging, and chatting, and Instagramming…. MS: and and and…But, that communication can leave us unsatisfied, as if we only got the trailers of movies and never got the resolution. TN: Which is why the work of storytelling and what you do is so crucial. MS: I have found in story workshops that the process of crafting a story is like closing an open circuit. TN: I love that metaphor! MS: There is always a moment of AHA! YES! MS: A neural circuit is created that never was there before. It feels good. MS: It helps all the chaos of our lives have context and more important meaning, I think. We long to have meaning in our lives. For our lives to have some meaning. Without a strong culture, it can feel like we’re buffeted around by trends and shifting values. But, with personal story, we get the chance to distill our own meaning from our lives. We are all the stars of our own movies, we just don’t always realize it. A story gives us the chance to look back and see it from the outside, cheer for ourselves as the hero. Even if our quest is just to win a game of capture the flag. The next Drunken Telegraph show is on April 11, 2014 at the Broadway Center. For those interested in storytelling, Megan and Tad are offering a free storytelling workshop at King’s Books in Tacoma this Sunday, January 26, from 2-4PM.